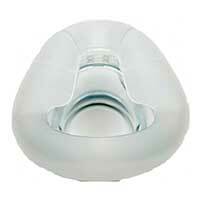 Small cushion for the Fisher Paykel Eson nasal CPAP mask. This cushion employ's F&P's patented RollFit seal, which allows the inside edge of the cushion to roll back and forth to fit a wide range of faces for an excellent seal. This cushion is also available in medium and large sizes. One cushion per package. **NOTE - this cushion fits the older Eson Nasal Mask. It will not fit the newer Eson 2 Nasal Mask. If you have any questions about the correct parts for your mask, please contact us via phone or email.